AMcCS with me after the lecture! I had decided to make a day trip to Edinburgh from London and that was easier said than done. I ended up taking the day train from London King’s Cross to Edinburgh Waverley and took almost 5 hours. One could have reached Paris or Brussels in half the time from London. However, as it turned out, the trip was my favorite of the lot and worth the time and expense. I reached Edinburgh around 1430 hrs and was taking the overnight sleepr train back. This basically meant that I spent more time traveling than actually being in Edinburgh. I ought to have named this post ‘Edinburgh in an afternoon’, me thinks! 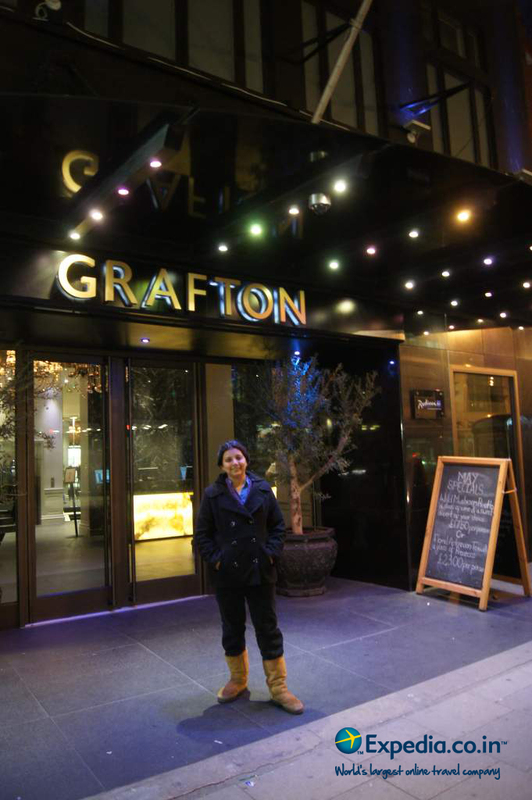 When I mentioned to my host from the Expedia office in London that I am really keen to visit Edinburgh, she went out of her way to help me get there. 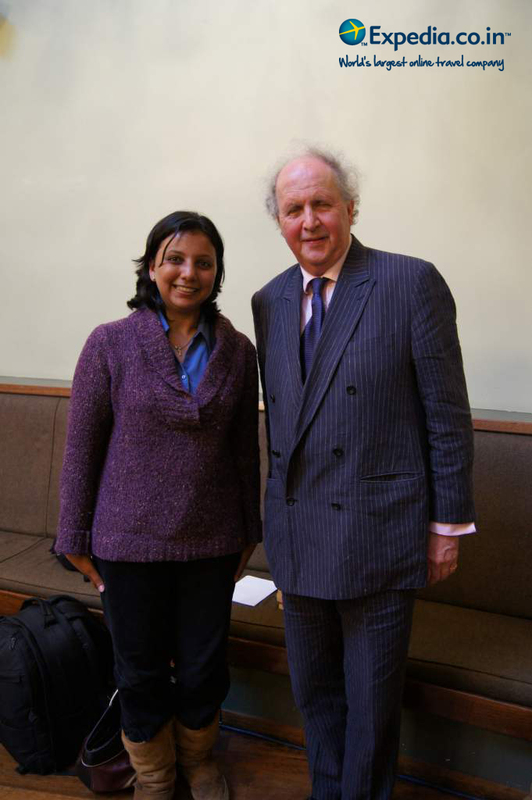 She said that Edinburgh was a beautiful city to visit and gave me pointers on places to visit. She asked some of her friends for activities to be done there and places to visit. The dungeon tour described below came highly recommended and can be booked through the Expedia site with Mercat tours (under their ‘Things to do’ category. 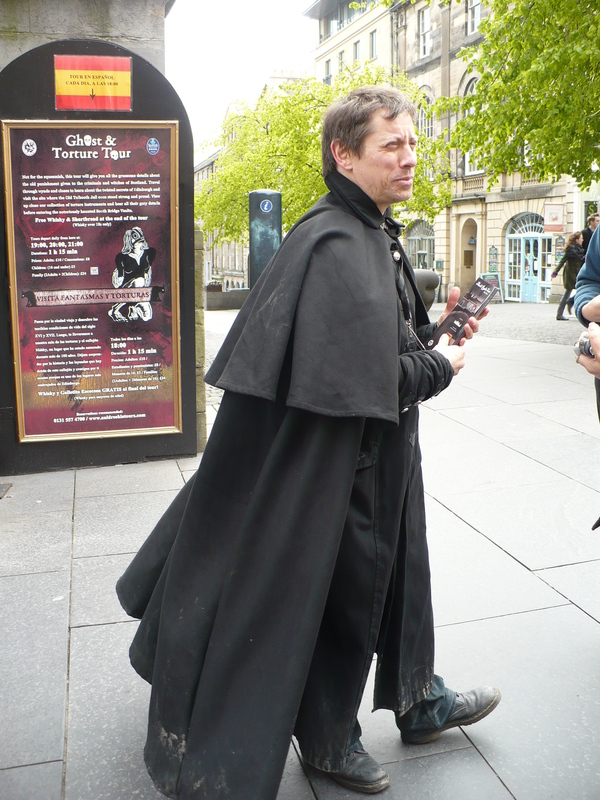 The ‘dungeon master’ whose commentary for the tour of the underground was fantastic! Anyway, after getting out of the station, my agenda as proposed by a friend was to walk to ‘The Mound’ for apparently lovely views of the Edinburgh castle. I was half-way there, when I noticed a hoarding with directions to the National Museum of Scotland and the museum hound that I am, sniffed my way to the museum instead thinking I could swing by the Mound for the Castle view anytime while the museum closed at 5 pm. So, off I trekked to the museum across Waverley and the North Bridge, when I came across a tour of the so-called ‘underground city’ or dungeons of Edinburgh (which came highly recommended). They had a 5.30 pm slot open for the Historical and Ghost tour which I promptly grabbed. So after my visit to the museum and grabbing a bite at the ‘Piemaker’, I set off to the dungeon tour. I thoroughly enjoyed the tour which ended with some Scotch Whiskey and Scottish Shortbread at a pub called the Banshee Labyrinth. This was on Niddry Street and very close to St. Cecilia’s Hall which was the reason I was actually in Edinburgh. From near the river Thames, we went to Westminster. After admiring the Big Ben and deciding to not enter the Houses of Parliament (there was a 2 hour wait) much to my disappointment (the architecture is breathtaking! ), we went to Westminster Abbey. From here, we took the much recommended walk to Trafalgar Square along Downing Street. After a quick walk through Trafalgar Square, we walked into the National Portrait Gallery. The gallery is absolutely fantastic. There was a special exhibition of Titian’s paintings on at the time I went in addition to their regular exhibits. From here we head to Soho for a late lunch at a quaint vegetarian cafe called Beatroot. This was followed by a visit to the Expedia office in Angel, Islington. The day ended with a walk along Regent’s Canal and an excellent dinner with friends. We saw a lot of London over the next few days – Regent’s Park, the British Museum, the Victoria & Albert Museum, etc., and thoroughly enjoyed everything we saw, ate, and heard. 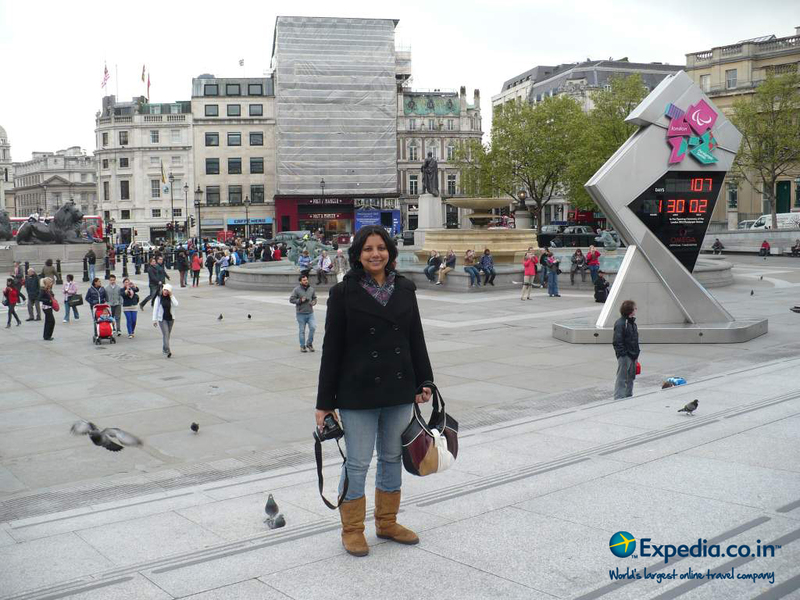 The Expedia website has numerous sightseeing packages listed that one could book online for hassle-free travel — right from their Hop-on Hop-off tours to the Total London Experience, and themed highlights. 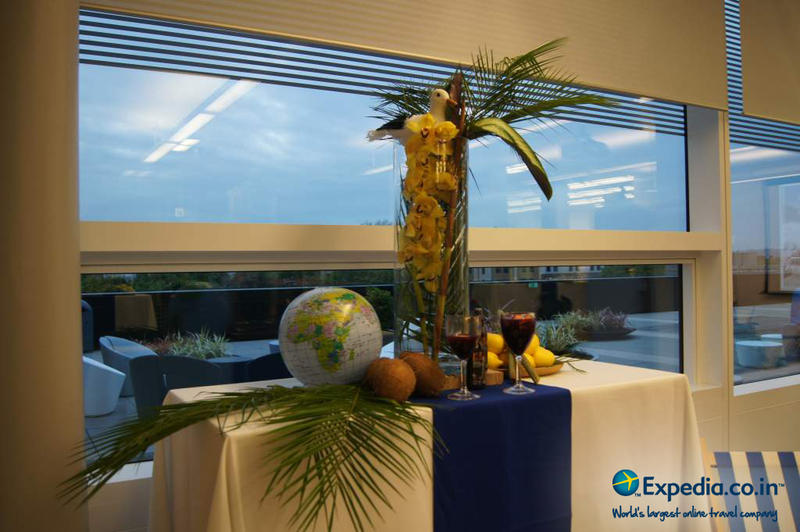 Sipping Sangria in the beach-themed party at the Expedia office. 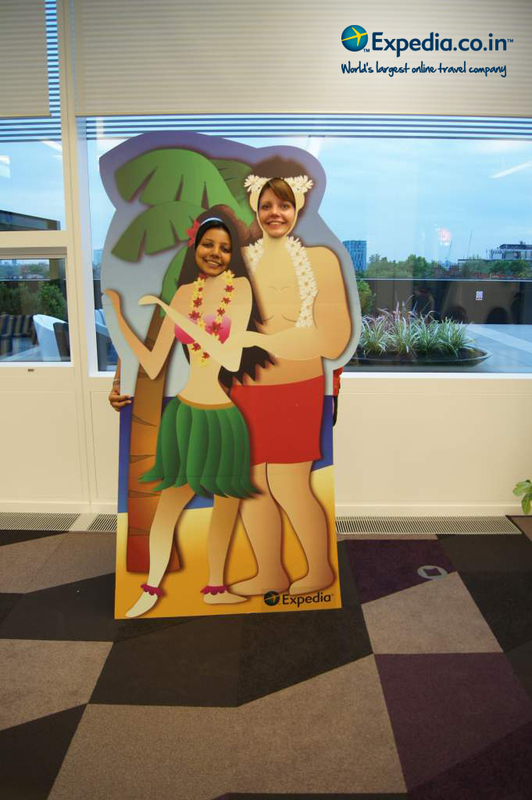 The party at Expedia’s London office is to showcase their latest research study on travel to beach destinations. While I had more than a day to spend in London, I decided to see how much of London’s tourist attractions one could cover in a single day. As it happened, my best laid plans of leaving early took a flip and I ended up starting a tad later than planned. 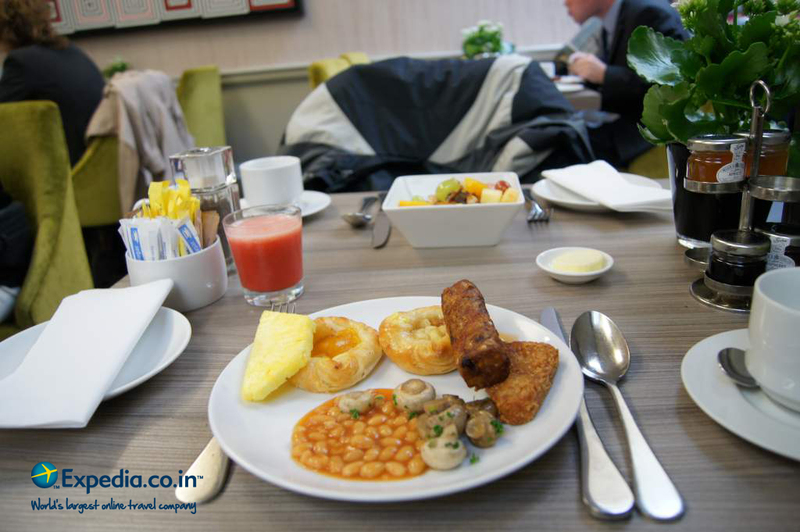 The Expedia experience has been fantastic so far and the arrangements excellent. 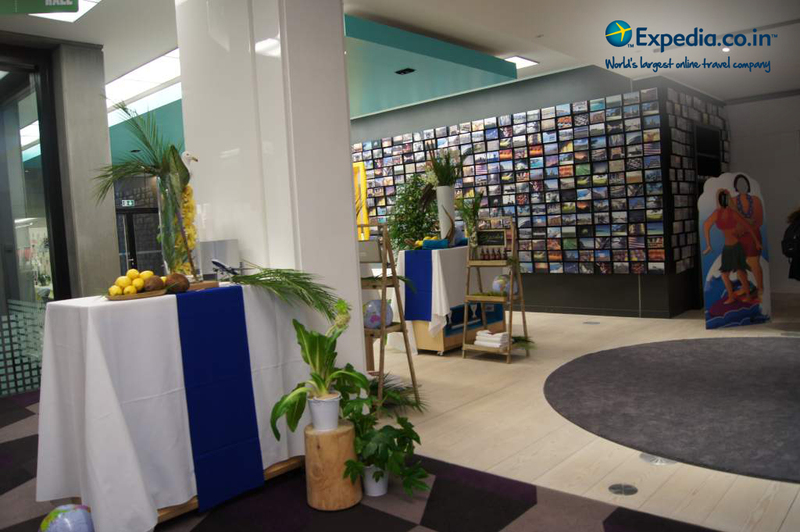 It was only fitting to visit the Expedia office in London and meet the people behind the organization. 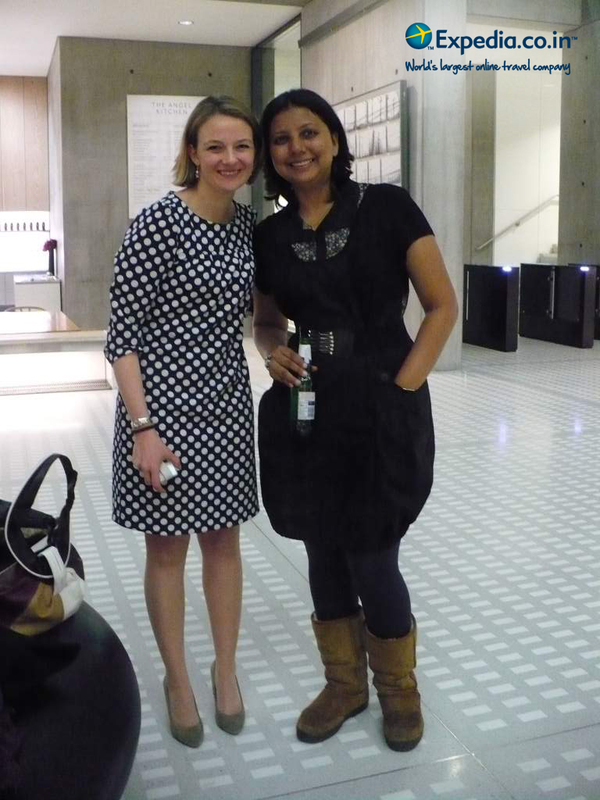 This meant planning a day spent exploring London with the icing on the cake being a visit to Expedia. took the ‘tube’ (as the London underground trains are called) from near the hotel to a stop near the Buckingham and an hour early for the ceremony. This helped get vantage spots for viewing. After a couple of hours at the Buckingham Palace, we left for our second stop making our way to the station through the attached Green Park. Breakfast like a king! Especially when outdoors on a cold and frosty morning! Next on the cards were the bridges across the river Thames. We walked along the Queen’s Walk and got good views of the London and Tower Bridges, as well as the HMS Belfast. We crossed over along the pretty Tower Bridge and walked the grounds of the Tower of London that has watched over the city on Thames for almost a thousand years now. The ‘beefeaters’ are the quasi-custodians of the Crown Jewels and also are tour guides for the Tower. We were in a hurry and didn’t take the tour. We proceeded from here (again by the tube) to visit the Big Ben area. 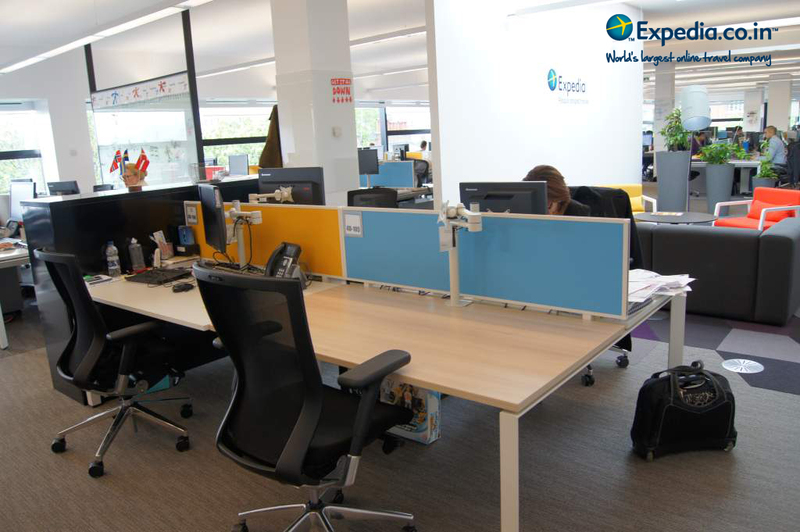 The Expedia office in London at the award-winning Angel Building. This is their European headquarters. 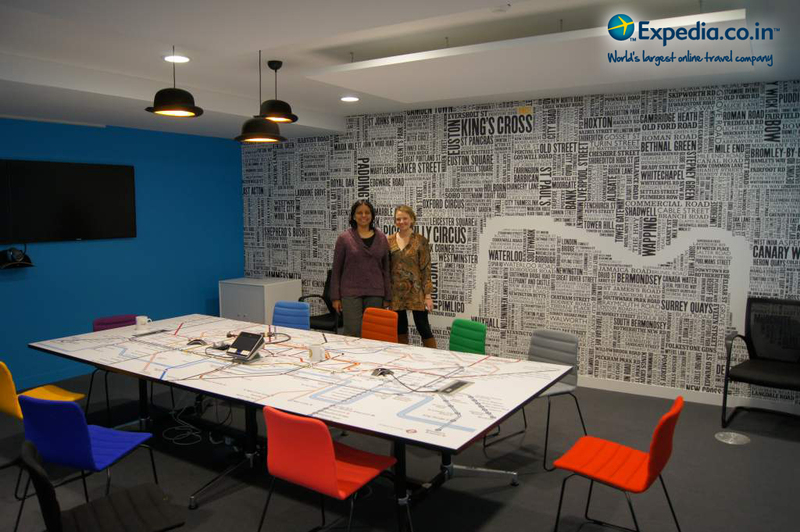 In the ‘London’-themed room inside the Expedia office with my fantastic host for the day! 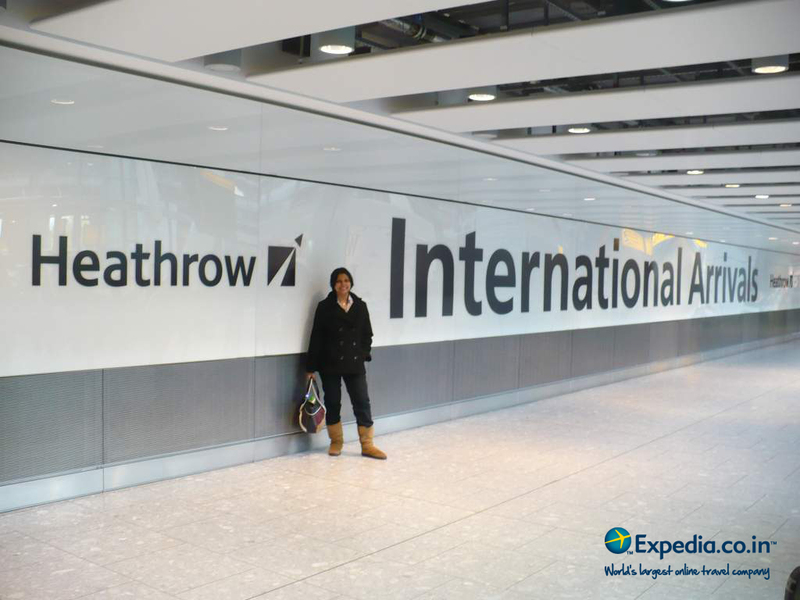 Go Expedia! This is the most fun office I have been to in aeons! Next on the agenda was the beautiful city of Bath. It sits on seven hills, much like Rome — no wonder the Romans set up home here as quickly as they could 🙂 We visited the Roman Bath Museum which also includes the ancient Roman temple of Sulis Minerva in its complex. It was certainly one of the best museums I have been to and was truly unusual. 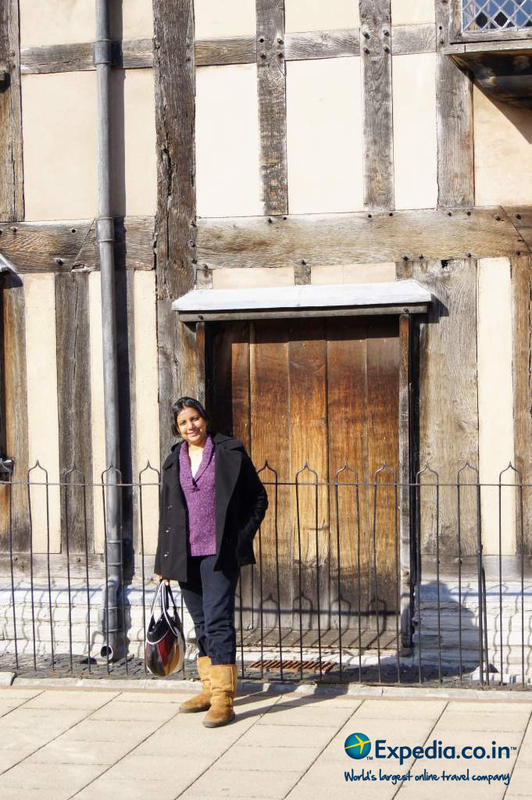 After a quick lunch of Cornish Pasties and Banana Nut Bread, we were off to the bard’s home inStratford-upon-Avon. This quaint little town sits on the river Avon and is obviously besotted to the person who pinned the little-known-town on the world’s map centuries ago! William Shakespeare is the pedestaled and undisputed hero here. We visited the Birthplace Museum which transported one to his era. We sat in the garden cafe in his former home sipping champagne and scones with strawberries, jam, and clotted cream, while actors spouted lines from his plays. That was a worthy end to a fantastic day that had us travel through the ages too — from the prehistoric to the medieval to the renaissance. Our ‘England in a day’ tour was a source of much amusement amongst our friends in England. 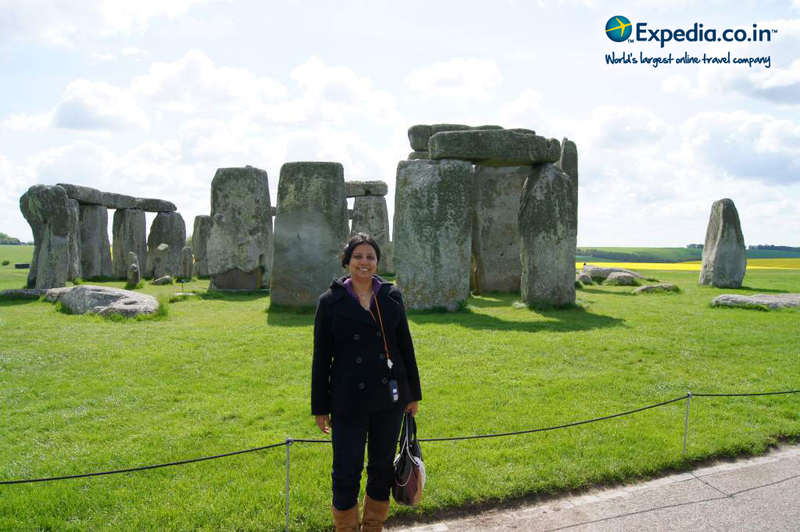 It was an ambitious journey from London to the Stonehenge on the Salisbury plains, the city of Bath housing the famous Roman Baths, onto Stratford-upon-Avon which is the birthplace and home of William Shakespeare with a drive through the picturesque Cotswolds, and back to London. All of this in one day. However, it worked and we had a magical time visiting all the places. First stop was the mysterious Stonehenge. Frankly, it was just some stones piled in a fashion but I was excited nonetheless and enjoyed the narration even though I secretly felt that it was ‘Much ado about nothing’. I think I would have offended everybody in the vicinity if I had voiced that opinion. Well, it is a World Heritage Site and I can say ‘been there, done that’ 🙂 The trip only got better from here. You can book a number of day trip tours and longer holidays through Expedia and the expedia.co.uk site has a wide variety of such tours that one can book. The tours are operated by different people but excellent with enjoyable commentary and comfortable travel. Put up at the Radisson Edwardian Grafton Hotel in Central London. 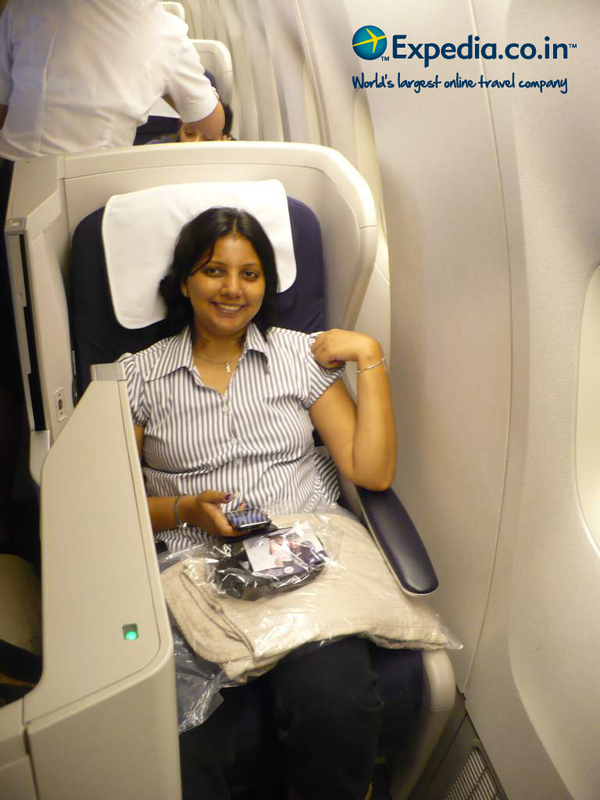 Here’s a toast to traveling Business class! Some bubbly anyone?